This is a message to some of the celebrities of Scientology. They are free to comment. If they dare. Before I get into individual cases, I want to tell you something that you may or may not know. You were targeted. From the time you first came into the public eye, you were on someone's battle plan. The people who brought you in got some great Tokens of Appreciation for getting you in and on you first services. It was all part of Hubbard's Expansion Plan and had been going on long before you got in. You don't have to believe me, it is in writing from Hubbard himself in Ability Magazine back in 1955. 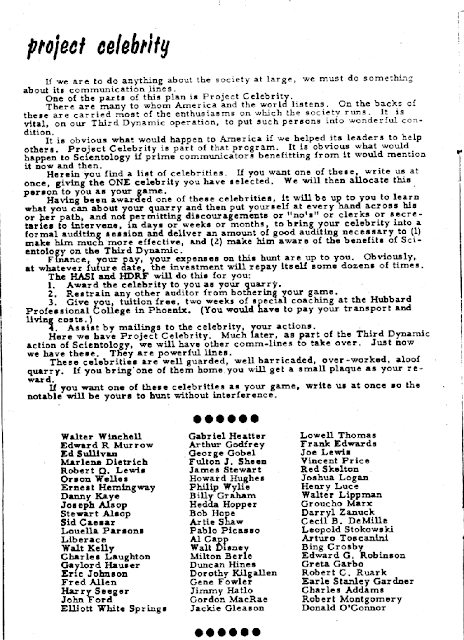 It was called "Project Celebrity". I want you to read that final paragraph again. 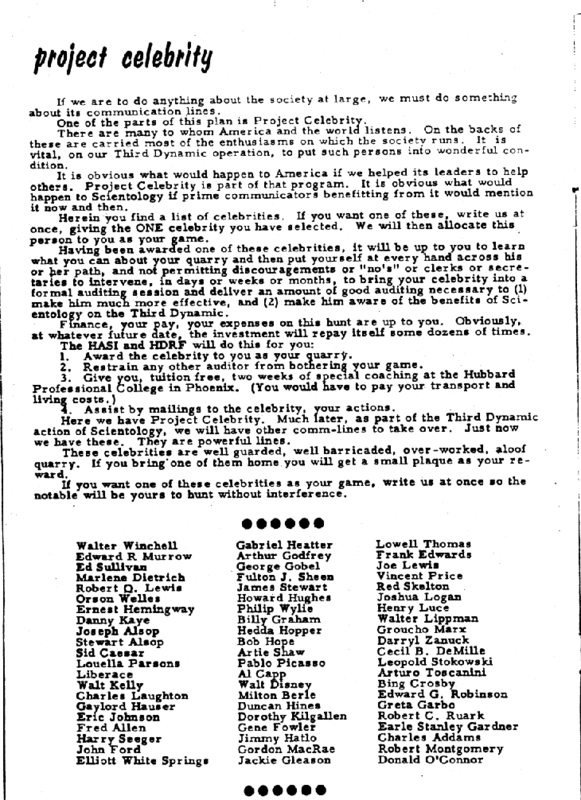 "If you want one of these celebrities as your game, write us at once so the notable will be yours to hunt without interference". How does that make you feel? Game to be hunted. The following is the opinion of the Author and may or may not be endorsed by the host of this blog. I admit to having a crush on you when you were on "Cheers", and you have always been a hell of an actress. Well done on losing all that weight and your performance on DWTS. Please understand that it was not Hubbard, Miscavige or Scientology that got you there. It was your own desire and drive. Please come out of the church and be the "Real Person" we all knew and loved. What a talent you have. But, did you not really understand the script you were reading when you made the episode "The Joy of Sect"? Just as a reminder - "The Simpsons did a whole episode on cults in the 1994 episode, the majority of which was based on the Church of Scientology. In the episode, a cult called the “Movementarians” takes over Springfield, and Homer and the rest of the Simpson family become members. “The Leader” physically resembles L. Ron Hubbard; the Movementarians’ “trillion year labor contract” alludes to the Sea Org’s billion year contract; and both groups make extensive use of litigation." Come on! You didn't see the similarities? What an incredible career you have had. For many, many years you have had the reputation of Hollywood's Mr. Nice Guy. A man of Honesty and Integrity. Is that the real John? Or is it just more Hollywood hype? Now days, there is a different kind of hype going on. I don't know if the stories are true or not. Frankly, I don't care and neither do most of my friends. For a while now, rumors have been circling about how you may not be enthralled with Scientology any more. I want you to think about this John. Maybe all of this bad press you have been getting lately is coming from someone in your precious "church" to show you what could happen if you don't toe the line. You think it couldn't happen? You need to learn about some of the mean, and illegal things they have done to others who have left. I have saved you for last because it is you I am most disappointed in. The day you stepped up and received your Freedom Medal of Honor from the International Association of Scientologists, was a day that almost all Scientology staff lost any remaining respect for you. No, I am not talking about the silly Video. That just turned off some of your fans outside Scientology. I am talking about an INSULT you allowed to happen against every Staff Scientologist that ever existed. You allowed David Miscavige to call you "the most dedicated Scientologist I know" and received your award without even acknowledging all of the people who made Scientology there for you in the first place. And while you and Mr. Miscavige are eating your wonderful dinners at Scientology 5 Star Restaurants, most staff are wondering if they have 20 cents for a package of Ramen for their dinner, or a place to cook it, or a private place to eat it, or a bed to sleep in. That, Mr. Cruise is dedication. I wonder if there is any saving left for you. Furthermore, I don't know if you are worth it. To all Scientology Celebrities. If you ever decide to leave, please know that there are thousands of ex-Scientologists out here that are more than willing to help. They will spirit you away to places where you can chill and think. They will not ask you for anything, and will never spill you secrets. Just let us know. Thank you my friends for reading this. If you happen to know any of the above, please feel free to share it with them. Hell, share it with everyone you know. More soon.